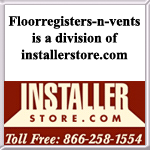 Change out old registers with new contemporary air vents which have a convenient one step, drop in installation. Our black floor registers are finished in a powder coat and are made out a steel core. This contemporary air vent will look good on any type of floor since it features a simple yet elegant vertical lined design. These black floor registers can also be wall or ceiling mounted, depending on the size. The black floor registers come with a fully adjustable steel damper which can be used both for heating and cooling needs. The 3mm thick contemporary air vent faceplate provides your black floor register with strength at a price you can afford. ***This item is currently out of stock. Tip: Remember that to order your contemporary air vent, you must measure the floor hole opening and not your existing register. A 4" x 10" floor register will fit a 4 x 10 hole size. Our black floor registers can also be used on the wall. The 2" and 4" wide contemporary air vents can be installed by using wall mounting brackets. Not for ceiling use. The 6" wide black floor registers can be used on both walls and ceiling since they come equipped with knock out screw holes. Check out our instructional video to see how simple installation can be! Need something different? We have a variety of metal floor registers. Try this contemporary air vent in its classic black color and modernize your home or office today!